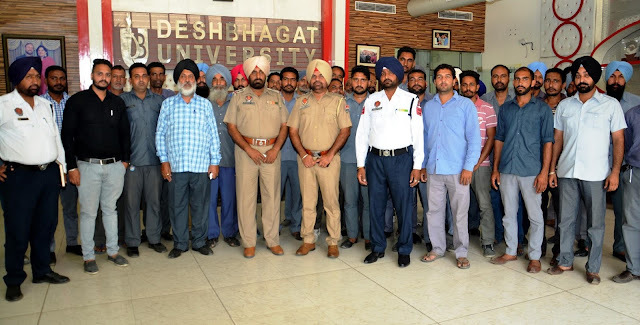 Desh Bhagat University’s Bhai Kanhaiya Ji NSS Department organised Road Safety and Traffic Awareness Programme. While giving details. 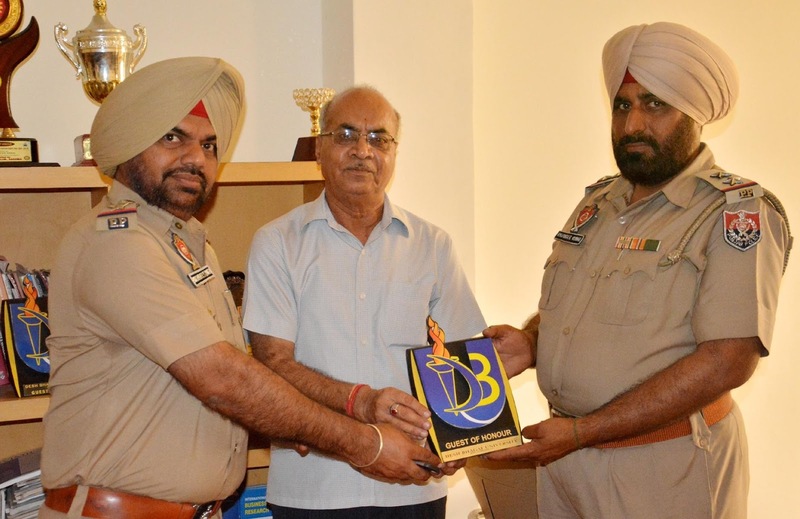 Pro chancellor Ms. Tajinder Kaur said that the event was conducted in collaboration with Traffic Police, District Fatehgarh Sahib to make the drivers and conducters aware about road ethics and to follow traffic rules. During this progrmme, Inspector Inderpreet Singh Traffic In-charge Zone-1, Fathegarh Sahib was key-note speaker , he educated all present about Road Safety measures. He exhorted the drivers not to use mobile phones while driving by giving examples of fatal accidents. He also discussed about the uses and importance of helmet, seat belt, speed limit , first-aid box, hydrolic gates of college buses and about necessary documents. Mr. Ravinder Kumar Traffic In-charge, Mandi Gobindgarh guided the drivers and conducters about the new traffic rules that are soon to be implemented. He also spoke on the subject of Rights and Responsibilities of the pedestrians, Two Wheeler Riders and Motorists. The event was followed by a range of queries put forward by the participents to which the learned speakers aptly replied. The Enforcement Role played by the Police was also discussed. University Chancellor, Dr. Zora Singh appreciated the initiative taken by BKJ NSS department and said that such programmes are need of the hour. Vice-Chancellor Dr. Virinder Singh emphasized that it is the duty of every citizen to follow road safety rules while driving any vehicle so that precious human lives can be saved.